This volume contains articles covering the centuries between the establishment of Carolingian power in Western Europe and the expansion of the Anglo Norman and Angevin ’Empire’ within the French kingdom of the Capetians. The common underlying themes of these papers are the exercise of political power, and the social position and resources of those who wielded power. 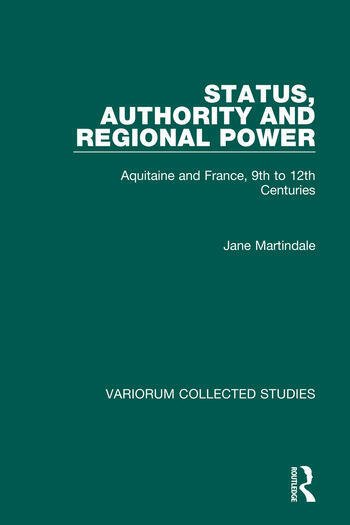 Aquitaine provides the focus for papers on regional government, individual rulers and members of the aristocracy - men and some women. The most important of the women considered is Eleanor of Aquitaine. The political and economic problems which confronted Carolingian kings of this region are discussed; and the later contribution of the secular ruler (duke, prince, and count) to the ’peace movement’ and peace in Aquitaine is reviewed. Two articles of wide scope discuss the character of the French aristocracy in the earlier middle ages, and consider connections between the acquisition of power and family inheritance patterns. The text of a Latin Conventum of the 11th century is printed with a new translation into English, while an especially written paper offers revised interpretations of this text, which has recently attracted much attention from historians. Contents: Charles the Bald and the government of the kingdom of Aquitaine; The kingdom of Aquitaine and the ’dissolution of the Carolingian fisc’; The nun Immena and the foundation of the abbey of Beaulieu: a woman’s prospects in the Carolingian Church; The French aristocracy in the early Middle Ages: a reappraisal; Succession and politics in the Romance-speaking world c.1000-1140; Peace and war in early 11th-century Aquitaine; An introduction to the Conventum inter Guillelmum Aquitanorum comitem et Hugonem Chiliarchum, 1969; Conventum inter Guillelmum Aquitanorum comitem et Hugonem Chiliarchum (includes new parallel translation with endnotes); Dispute, settlement and orality in the Conventum inter Guillelmum Aquitanorum comitem etHugonem Chiliarchum: a postscript to the edition of 1969; Aimeri of Thouars and the Poitevin connection; ’Cavalaria et Orgueill’: Duke William IX of Aquitaine and the historian; Eleanor of Aquitaine; Index.